So, a couple months ago, my son asked me to knit him a blanket. He’s four. All things in his world revolve around bright bold colors. So, I knew when he asked me for a blanket, he would want a bright and bold blanket. He confirmed this when he told me he wanted rainbow colors. I set about trying to find a pattern that I could just pick up whenever. I don’t have a ton of time for free time knitting, but I do try and fit some in everyday. Often, there are doctor’s and therapists offices and times spent waiting for older kids to come to the car or hockey games that are too intense for projects requiring concentration. I like to carry something I have memorized or easily looked up on my tablet. 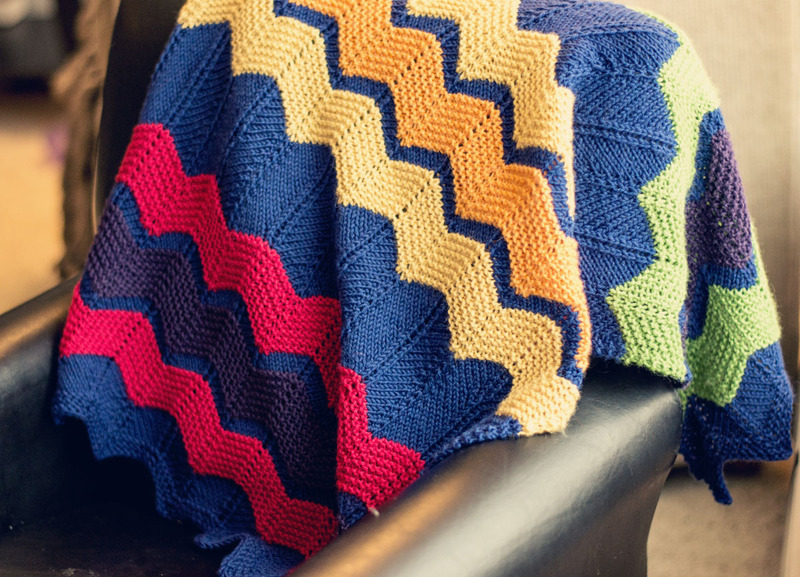 The Walt Painted Chevron Blanket by Danielle Romanetti, was just perfect. I did make a few changes. I omitted the pfb direction as I just prefer not to do those. I also, centered the middle garter chevron grouping. I also added an additional repeat to the width. It came out to about 32″ w x 37″L. Choosing yarn took me a while. The only brand suitable, which had all the colors I needed in stock somewhere was Cascade 220/220 superwash. I went with the superwash. I wanted to make sure that if dad (or anyone who isn’t familiar with non-superwash wool) needed to wash it quick and threw it in the was,h that all would be cool! Colors…well I let my toddler pick them. He did a really good job, too. This came out perfect as a cuddle blanket for him. « Random Thursday Flash Sale!